Is the pension governance burden finally tipping the scales? Despite concerns around member outcomes, schemes expect no let-up in pension governance complexity. Alice Evans and Louise Williamson from the LifeSight team reflect on the findings of our recently released Future of DC Survey. The article focuses on the concerns raised about governance and the impact this could have, both directly and indirectly. Against a backdrop of ongoing changes to DC pensions, from the formation of the Pensions Regulator (tPR) in 2005 to the DC Code of Practice consultation announced in November 2015, the last ten years have seen a barrage of legislative, administrative and governance changes for DC schemes to implement. Our Future of DC survey focuses on scheme priorities and issues today, as well as how they may change in the future. The overall picture is one of scepticism of the impact of governance changes so far and a desire to change the focus going forward. 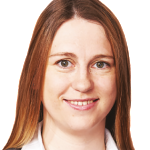 Schemes have also been taking steps to accommodate pension freedoms but there is an appreciation that there is more to be done. It may not come as a surprise that over three-quarters of those surveyed acknowledged that changes in governance requirements over the last 5 years have made the role of the fiduciary significantly more demanding. Our research also showed that the majority of pensions managers (61%) do not agree that changes in governance over the last five years have improved member outcomes. Regulatory change was the major concern for respondents, with over half (53%) citing legislation and regulation as the main barrier to better governance, followed by lack of time. Over half (55%) said they would like to spend less time on compliance and a third (34%) would like to reduce the time spent on administration. 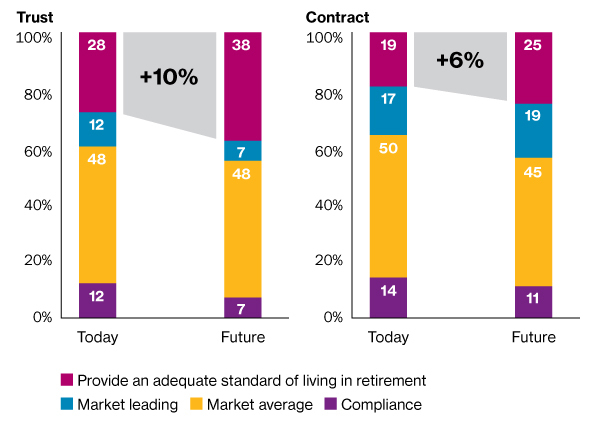 In light of this, it is not a leap to see there could be a connection with over three-quarters (79%) of those representing trust-based pension plans seeing their own type of schemes becoming less prevalent in the next 10 years. In their place, a similar proportion (74%) predict the number of master trust schemes will increase. When asked about the future, pension schemes plan to focus on strategy, by prioritising their activity on monitoring members’ behaviour and providing better retirement support. Over two-thirds (68%) of respondents would like to prioritise helping members at retirement in the future, but currently only 17% are able to manage it. Similarly, a third (31%) would like to spend more time monitoring member behaviour in the future but only a handful (3%) do so now. When asked for their predictions around the future of DC governance, 94% of respondents believe that compliance requirements will increase in the next decade and 96% believe that complexity will increase for members. Given the frequent changes to pension regulations over recent years and further anticipated tax shake-up in the upcoming budget, it is natural for many to struggle to believe that any ‘pension simplification’ programme will achieve the desired effect. These findings suggest that, despite employers increasingly wanting to see more of a focus on the quality of their retirement, governance is still very much directed at compliance and managing risks. Across the industry, there is a need to help pensions managers and trustees to navigate the increasing complexity so that good governance leads to good member outcomes. What remains to be seen is whether schemes will be able to do so when there are so many other obligations and requirements to be addressed with limited resources. Further complexity, with little perceived benefit, could drive employers to look to outsource the day-to-day management of their schemes to allow business focus to be better directed elsewhere. This day-to-day support can be offered in a number ways, from lighter touch reviews to full outsourcing. Pensions consultants have developed a range of tools to assess a scheme’s existing structure and help ensure the path to an efficiently run DC scheme is as clear as possible for trustees and pension managers to navigate. For those who are looking to fully relieve themselves of the governance burden, master trusts are increasingly becoming an attractive option. Master trusts (such as LifeSight) not only offer a fully outsourced pensions solution, but can also be used as a vehicle for drawdown only, to alleviate the complications and cost of setting up and providing an in-scheme option. As well as having the ability to look after the ongoing compliance requirements, the scale and expertise offered by a high quality master trust provider means they may be better equipped to tackle the challenges of improving member outcomes, communicating and demystifying complex issues, as well as helping members better understand the choices that they are making. This does of course assume that master trusts offer a strong level of governance and this cannot be taken as universally true for all such arrangements. We agree with tPR that master trusts need to be just as accountable to regulatory scrutiny as both trust- and contract-based schemes. Although industry-recognised accreditations such as Pension Quality Mark (PQM) READY and the Master Trust Assurance Framework (MAF) require major investment, we believe that the Regulator should make it mandatory for all master trusts to achieve such qualifications within a set timeframe. Mandatory accreditation would go a long way to promoting best practice around charges, governance and communications, as well as a reputable and trustworthy industry. Whilst so much has already transpired, the next twelve months will prove an interesting time for the everchanging face of pensions governance. Eyes will increasingly turn on master trust providers to see how they measure up to the new demands being placed on them by both the government and the employers whose funds are secured with them. The Future of DC survey was conducted between September and October 2015, with 99 responses from fiduciaries of pension schemes in the UK.